If you're ready to move up to a louder (think better!) 3-way system, but can't afford a bigger van, then Mackie's SA1530z is a logical choice. 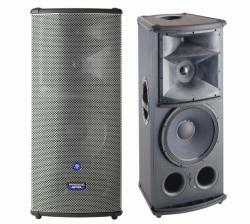 The SA1530z is a high-efficiency, extreme output, horn-loaded, 3-way, wide-dispersion, Active sound reinforcement system. The one-piece 90 x 40 horn, which includes both the mid- and high-frequency sections in Mackie's Optimized Wavefront? system, fires the HF content slightly downward into the midrange dispersion pattern. This creates a focused, single wave front with excellent coverage, phase and power response characteristics. The SAz Series represents Mackie's most powerful Active loudspeakers to date; re-engineered from the ground up and tuned by the gurus at Eastern Acoustic Works (EAW). The low-frequency amp delivers a whopping 1100-watts to the premium 15" woofer, and the Neodymium midrange and HF transducers each get their own 100-watt amps. And since the 6" midrange transducer operates between 700 Hz and 3000 Hz, there is no need for a crossover point in the middle of the critical vocal frequencies. We're talking smooth midrange. ...running, that is. The amplifier modules sit atop a massive aluminum heatsink, eliminating the need for fans. The tremendous benefit of having the amplifiers located within the loudspeaker cabinet is that the SA1530z functions as a complete system, optimizing acoustic, electronic, and mechanical designs to achieve the highest level of performance and value. Each SAz cabinet is constructed using both 18 mm multi-layered plywood and pressure injected structural resin. Weight balanced carrying handles are integrated into the sides and top for easy loading and transport. The SA1530z a big, and we really mean big, bang for your buck.